SK 47/57 378695 (Closed circa 1926). 1896. Owned by Samual Low & Sons, Brampton. 13 men employed underground and 3 on the surface. Mining Deep Hard coal and fireclay. 1908. Owned by the Turnoak Colliery Company, Unstone. Manager, W.S. Elphingstone. Under-manager, W. Soar. 36 men employed underground and 5 on the surface. 1918. New Turnoak Colliery Company. 32 Glumangate, Chesterfield. Manager, R. Braidford. Under-manager, W.Soar. Employing 47 men underground and 18 on the surface. Best Low Main Hard Cobbles 10/6d per ton delivered, Unscreened Cobbles 8/6d per ton delivered, Rough Slack 5/6d per ton delivered. N.B. The above prices include carting to any part of the Borough of Chesterfield. The coal is sold only upon one condition: viz: Cash with order. 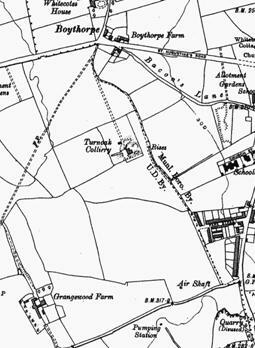 The Turnoaks Colliery Company were granted a licence to store explosives in a building on the site of the old Broad Oaks Iron works on Derby Road. Seven Chesterfield boys aged 14-16 were involved on Sunday afternoon in an explosion which was caused by one of them throwing a lighted 'Little Demon' firework down a disused shaft. The accident occurred at the old Turnoak Colliery off Derby Road Chesterfield which has been closed for eleven years.